Interested in learning How To Guide? This How to Guide - Journey Book Set is the companion How To Guide for adult volunteers. It provides key information about the journey, its awards and its leadership benefits, and step-by-step sample plans for how journey sessions can unfold as girls come together and meet. The adult guide also features sections on Girl Scout history and how to understand girls at each grade level. Each "How To Guide" / Journey Book Set has everything adult volunteers need to enjoy this amazing journey right along with their troop. You only need to bring along your enthusiasm and sense of adventure. 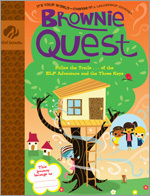 The How To Guide and Brownie Quest Girl's Book includes Brownie Quest map/poster.